Facebook also conducted similar research on behalf of the company’s chief operating officer, Sheryl Sandberg. 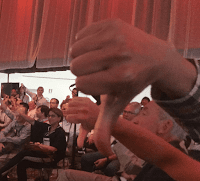 Surveys measured awareness about Sandberg, whether people liked and trusted her, and how they felt about her speeches, interviews, and Facebook posts. McGinn also surveyed people on whether they associated Sandberg with Facebook or her personal initiatives, such as Lean In and Option B. But it is unusual for a company to have a staff person charged exclusively with monitoring perceptions of its CEO full time. Facebook began monitoring Zuckerberg’s perception about two years ago, a spokesman says. The move reflects his close association with Facebook’s brand and his role as the company’s chief spokesman. Zuckerberg regularly posts announcements on his personal Facebook profile, which has more than 102 million followers. Understanding how Zuckerberg’s posts and speeches resonate globally could help the company navigate a difficult period in which it has faced stern criticism from lawmakers, regulators, journalists, and average users. The company declined to comment on McGinn’s role, but the polling was not designed to influence Facebook products or policies, a spokesman said, and no specific changes have resulted from it. McGinn declined to discuss the results of his polling at Facebook, saying nondisclosure agreements prevented him from doing so. But he said he decided to leave the company after only six months after coming to believe that Facebook had a negative effect on the world. After McGinn left Facebook, he founded a new market research firm named Honest Data. On January 27th, he posted the results of a poll he had conducted regarding opinions of Facebook. 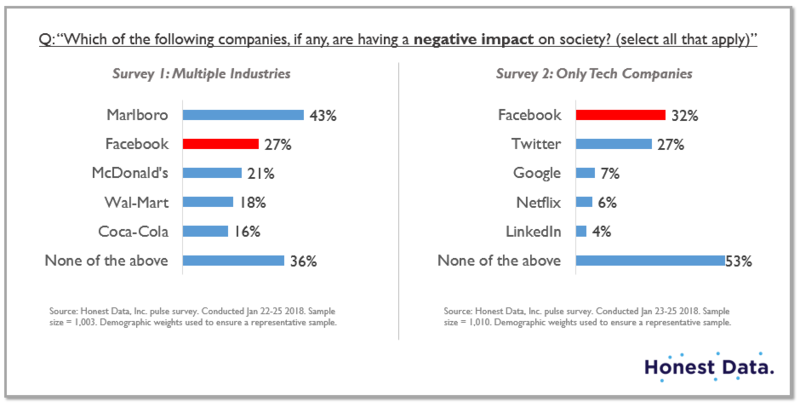 The poll, which surveyed 2,000 Americans using Google Consumer Surveys, asked respondents to evaluate a list of companies and mark which ones “are having a negative impact on society.” Among tech companies, 32 percent of Americans said Facebook is harmful. A separate survey, which placed Facebook among other large brands including Walmart, McDonald’s, and Marlboro, found that 27 percent said it is harmful. McGinn says there are “plenty of good people at Facebook trying to make a difference.” He doesn’t believe the company has acted with bad intentions. But he does believe the company’s priorities have had negative consequences. “I think Facebook could have a really good impact on society,” McGinn says. “I think a lot of what this comes down to is how a company chooses to measure success.” The company’s historic focus on acquiring the maximum number of users, and occupying the maximum share of their time, distorted its perspective, he says.